It’s an exciting day in the jewellery department today. 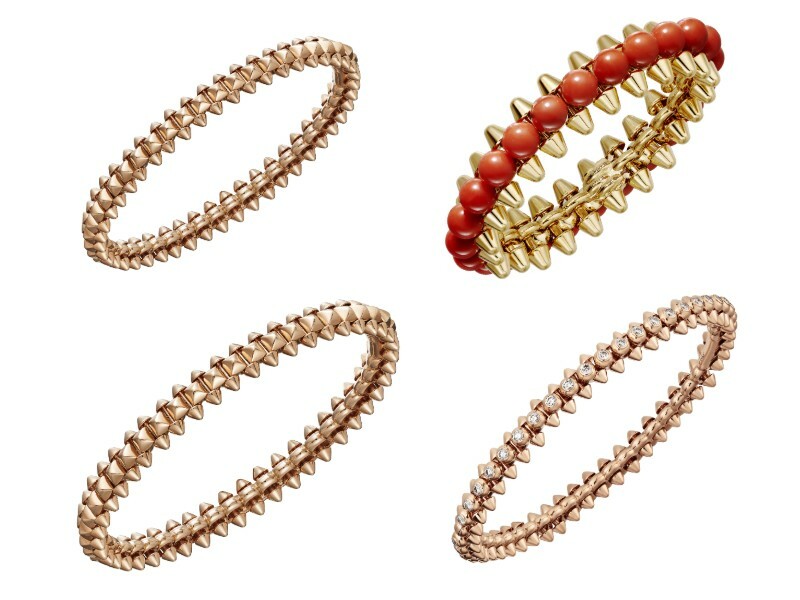 The French luxury house of Cartier is officially dropping a spanking new jewellery line called ‘Clash de Cartier’. An official (and very star studded) party is scheduled to take place this evening in Paris. The collection is fronted by the 27-year-old English actress, Kaya Scodelario — famous from her roles in the teenage drama Skins, the movie Maze Runner, and Pirates of the Carribean. Irreverent yet elegant? That definitely sums up the jewellery pieces. 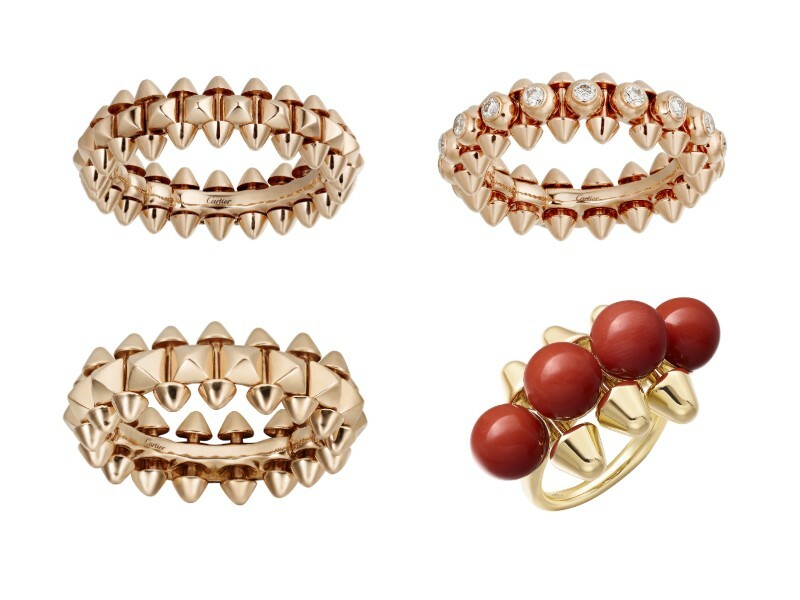 This new collection revisits the French luxury house’s use of geometric studs and beads throughout the brand’s history. Jewellery pieces include rings, hoop earrings, bracelets, and necklaces. While the studs look harsh and rebellious up close, they surprisingly feel graceful when worn in person. This collection comes in lieu of the heavily-beaded Cactus de Cartier collection which launched in 2016, and another series of studded Baignoire Allongée ladies watches which debuted earlier this January at the watch trade fair, Salon International de la Haute Horlogerie Genève (SIHH). Although the Baignoire watches were solely decorated with square studs (or clous carrés), the Clash de Cartier jewellery pieces feature square, round studs and gold spheres. Left column (top down): a small pink gold ring (S$2,920) with a visibly thinner band decorated smaller and refined studs, contrasted with a medium pink gold ring (S$4,250) with a thicker band and chunkier studs. Right column (top down): a medium pink gold ring embellished with diamonds (S$11,700); a limited edition extra-large 18k yellow gold with spherical coral gemstones (S$15,550). Left column (top down): a pair of small pink gold hoop earrings (S$5,350) measuring 1.6 cm in height; a pair of medium pink gold hoop earrings (S$10,300) measuring 3.8 cm in height. Right column (top down): a limited edition single extra-large yellow gold earring (S$17,200) with coral gemstone spheres; a pair of small pink gold hoop earrings with 14 diamonds (S$18,900) measuring 1.6 cm in height. 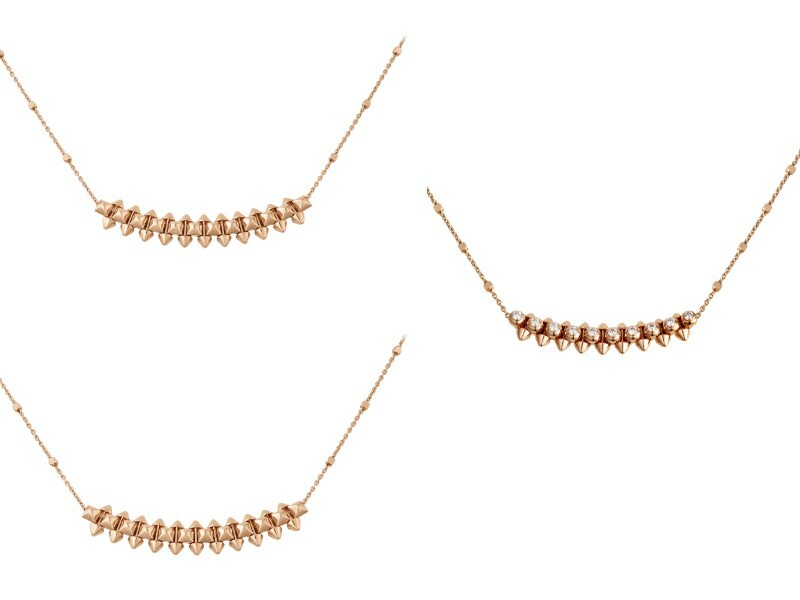 Left column (top down): a small pink gold bracelet (S$9,100) with a thinner band measuring 0.6 cm in width, contrasted against a medium pink gold bracelet (S$12,100) with a thicker band measuring 0.8 cm in width. 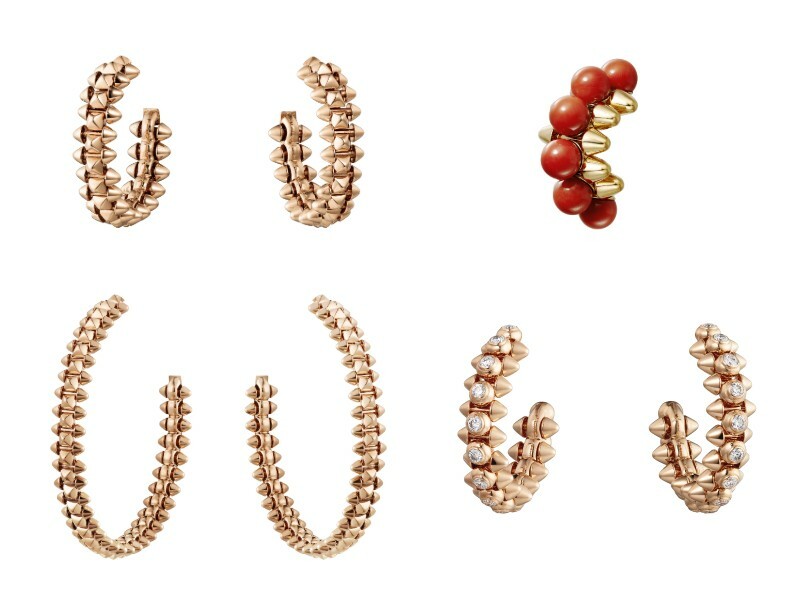 Right column (top down): a limited edition extra-large yellow gold bracelet (S$72,500) with spherical coral gemstones; a medium pink gold bracelet with diamonds (S$32,500) launching later in September. Left column (top down): a small pink gold pendant (S$3,300) measuring 0.6 cm in width with chain; a medium pink gold pendant (S$4,850) with a thicker band measuring 0.8 cm and chain. Right: a small pink gold pendant with 10 diamonds (S$8,600) with chain.